Fish Head Curry in Kuala Lumpur at Annuar's Legendary Street Food Corner! Fish Head Curry in Kuala Lumpur at Annuar’s Legendary Street Food Corner! Few times in my life have a seen a restaurant owner more dedicated to their work. Let alone a chef, I don’t know how many people I have seen in any job anywhere just so motivated to do their work well. 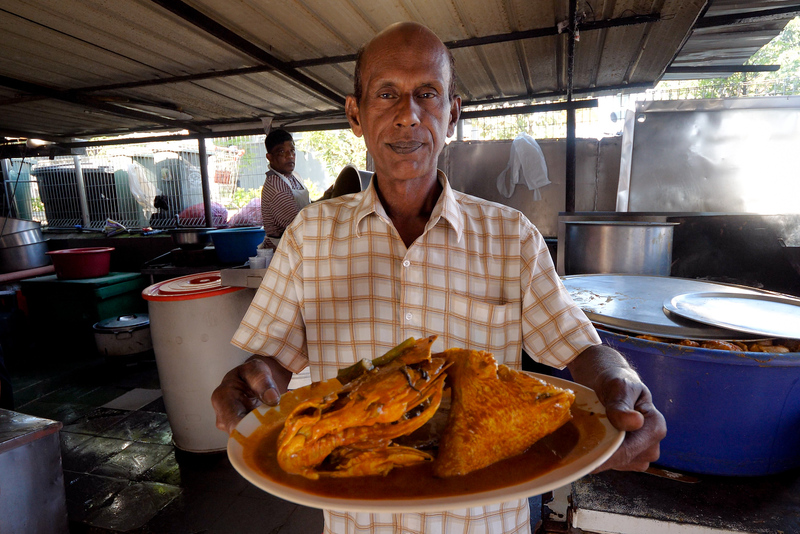 In Kuala Lumpur, Malaysia, come and visit this amazing man, Mr. Annuar, and enjoy a wonderful Indian Malay style fish head curry (his specialty). Scroll down, I want to share more details of this meal with you. 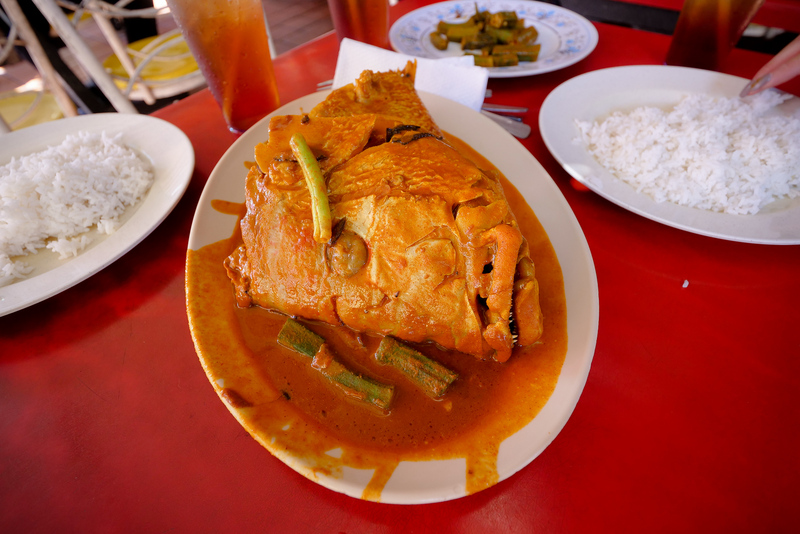 ‘Annuar’s Fish Head Curry,’** previously known as ‘Bangsar Fish Head Corner, is a restaurant that specializes in an amazing recipe of Indian-Malay style fish head curry. Although this dish has roots in two foreign countries, fish head is a food probably loved nowhere more than it is right here in the Malaysian peninsula. 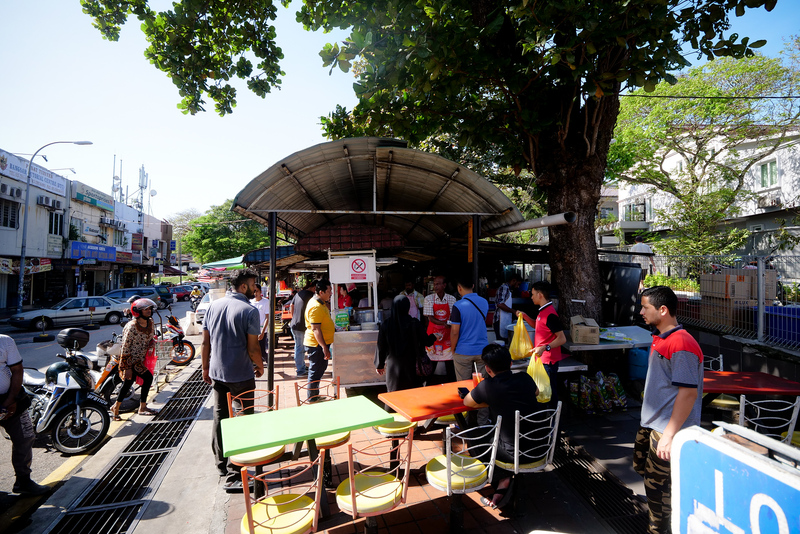 While eating at Mr. Annuar’s restaurant is something I obviously recommend, you don’t need to take my word for it – the line of people stretching down the street every single day is proof enough. What I can assure you though, is that you will take away much more than just delicious food when you visit here. The motivation I got from seeing how Mr. Annuar works his restaurant jobs, it was and is so memorable, truly something to admire. As soon as we were sitting down, Mr. Annuar was greeting us, giving us a chance for photos, he turned his back to sample a spoon of curry, but then also made sure to take our drink order. While relaying on some instructions for something going on behind the pans, he was also keeping eyes on his next batch of chicken, just finishing in their frying oil, which he also got up to serve to other customers himself. This humble display of such high work ethic was impressive to say the least. Not only was he friendly, but he is so obviously dedicated to keeping in mind every step of each process at all times, while still being personable to his clientele. Amazing. 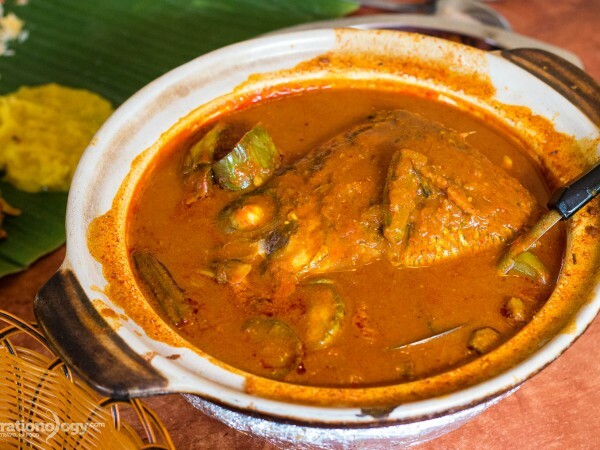 Note: The name of the restaurant has changed to ‘Annuar’s Fish Head Curry’ after moving to a new location, and the links and information at the end of this article are updated and current as of Jan 2019. Indian-Malay style curry, a flavor that is so good its actually worth traveling for. Getting back to the food now, I want to introduce this stunning curry from what hit me first – I have to talk about the smells. Annuar’s Fish Head Curry is actually part of a three-restaurant location, sharing the seating space between all three – but trust me – you could easily use just your nose to find the right one. Walking up to the converted street cart they use here to serve an entire restaurant-size seating area, you can already smell the deep, rich, pungent curry flavors from down the street. This is step one actually, as even the sign for Annuar’s Fish Head Curry is one of the things farthest back in the restaurant. Use your nose, and your eyes (the line of people forming is quite obvious), and find your way to the serving table. Note: The massive cauldrons of orange-red curry are gorgeous, they are resting right in the middle behind the serving area, if for some reason you are still unsure, then use these for confirmation. 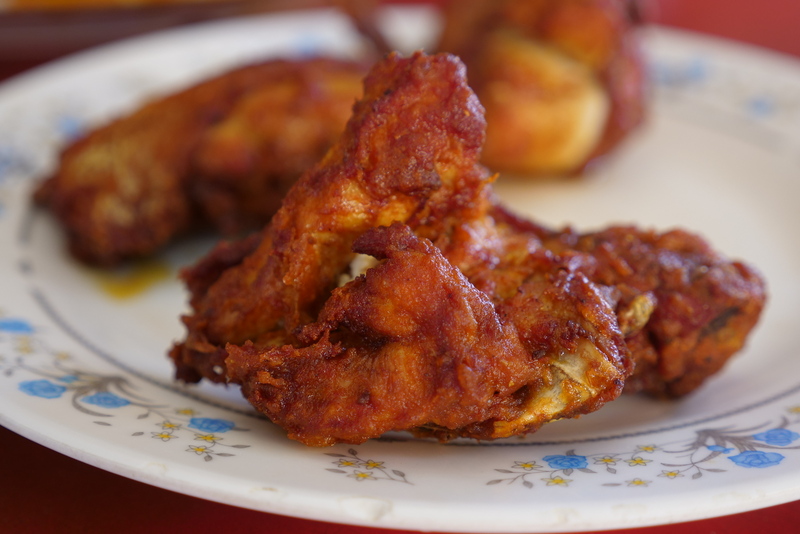 The local favorite is the fried chicken, covered in the rich, spicy red curry sauce. Step two would be finding a seat. After this, as with most outdoor or street food restaurants in Malaysia, you are then going to need to serve yourself your first plate of rice. I just love Malaysia’s attitude with in-restaurant self-service. Find the stack of empty plates, and then the container of rice. You reach inside for the rice scooper, and take as much as you want, spreading it around so that its perfectly ready to soak up as much of the red curry broth as possible. Important! Try to smoothly make eye-contact with a chef, and hand over your plate of rice for a few bonus ladles of curry sauce. There’s no real limit, or rule here, on how to get more sauce, but trust me – you want more sauce. Their curry sauce here is wonderful, and its where the fish heads are cooking. 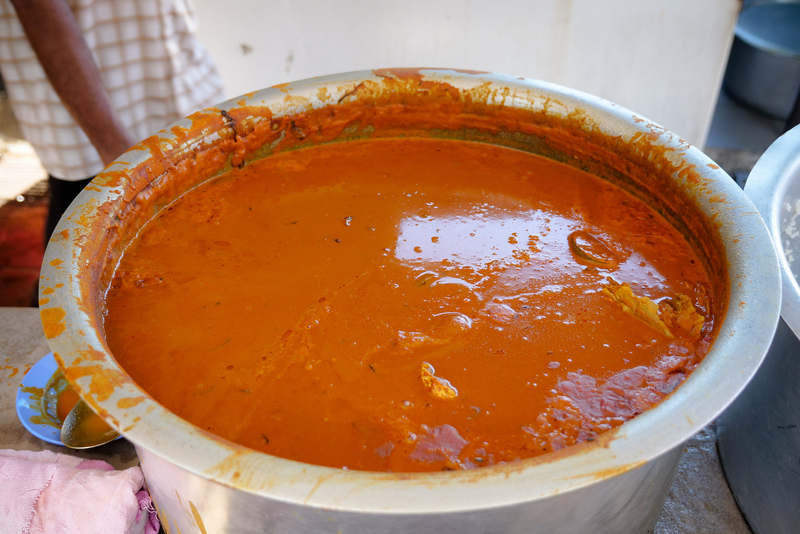 Full of curry powder, curry leaves, also including fenugreek and mustard seeds, the medium-spicy curry broth is lathered onto everything. Just as it should be. It is very much worth noting here though, that the favorite meal at this restaurant is not the fish head – its the fried chicken. Fish head is what they advertise (‘kepala ikan’ in Bahasa Malay), but actually the chicken is the more famous item among locals – that’s the item you’re bound to see on every person’s plate. The chicken is quick to dish out, easy to pick up, and its one of the most budget-friendly meals in the entire city of KL. A pile of chicken works just as well as a fish head too, as a great central feature to your table, surrounding it with your plates of rice. Both are of course, absolutely drowning in large ladlefuls of that curry broth, so I would very much still recommend coming here, even if you aren’t into fish heads. Finally its our turn to eat, and the star of the meal arrives. The Fish Head is here, and again I have to say – quite cool to see how the delivery of each fish head is undertaken by Mr. Annuar himself. Not at all due to an arrogant sense of pride, he is just very happy to show something that takes hard work. 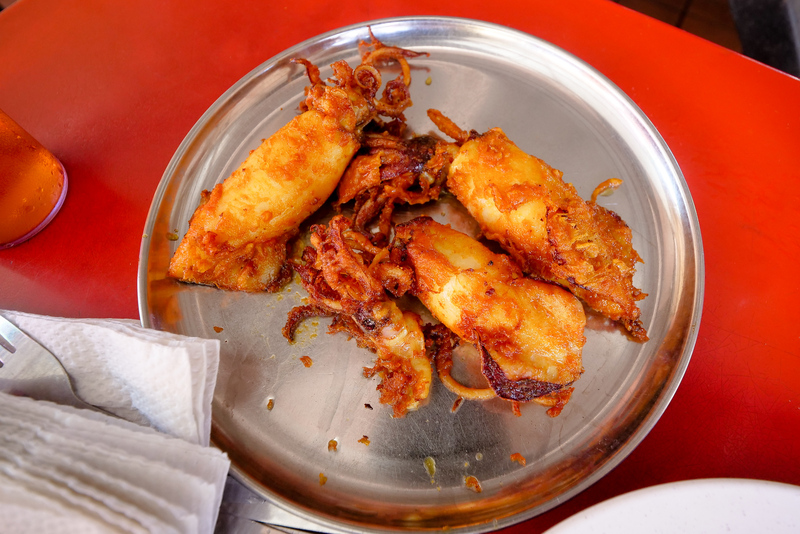 It takes dedication to locate such fish heads, and then to make them into such delicious curries. Being near the fruit of his labor, his product being something that makes customers so wonderfully happy, it so obviously just brings him satisfaction. Even though he is incredible busy (not only creating all the recipes, but also even helping other serving staff in de-organ-ing the squid and cleaning the chicken parts), he makes sure to come to each table, at least check on how things are going, and with our table he even made some time for photos. Exchanging few words, his smile shows his satisfaction, and then he is gone, again returning to his cart for other customers. Mr. Annuar also told us that he himself chooses the fish heads by size, and he gets them from a vendor who is selling the rest of the parts and the body to other restaurants for other recipes. Here they want only the fish’s head, and he picked out our Red Snapper (‘Ikan Merah’), which was also one of the most impressively size-able ones of the day. You can see the size just by looking at the plate itself, and as any lover of fish head will tell you – the bigger the size, the larger the amount of succulent meat parts to be found hiding out in every crevasse of that big fish’s skull. Also check out my guide to best Singapore food! After enjoying yourself to the fullest with endless bites of crunchy curry chicken, then sucking out every glorious nook and cranny of your massive curry fish head, then there is still a dessert. I mean be honest, and tell me there’s some way you can see a squid like this and not ask for another just like it. It was smothering in that same gorgeous orange curry, and wow does it smell great. The thick squid flesh, bouncy texture and not too rubbery, the tentacles are the place on the squid where you really get the most flavor. They sort of just reach out, and give so much more surface area, perfect for all of the flavorful red curry to stick to. There were not as many people ordering these as there were people fighting over Mr. Annuar’s fried chicken, but in my opinion this meaty squid was equally as delicious. This is the view of what may soon be your new favorite Malaysian street food. Such a great meal at Annuar’s Fish Head Curry, and do I have to again mention the price? Just 3RM for either chicken or a fish, ladles of curry sauce, and a full plate of white rice. Now that’s a budget meal. But even after that, I also have to comment on the overall experience of visiting Mr. Annuar. He did not know of this blog, nor was he aware of our YouTube channel, but he was just humbly yet confidently wanting to show off the beautiful recipes that he works to create every day. He took photos with us, allowed us to peek into every detail of his work, and he gave us our meal for free and even went to wash his hands specifically at the end, just so he could shake hands with us as we left his restaurant. Annuar is his name, and Mr. Annuar works here every day. He serves a stunningly good breakfast of curry and rice, and the quality, and the friendliness and generosity on top of the amazing flavor of food – for street food in South East Asia, it literally can’t be beat. Don’t miss the chance to visit him at Bangsar Fish Head Corner, on your next visit to Kuala Lumpur. He will likely make your experience at this restaurant one of your favorite memories during the entire visit to Malaysia. 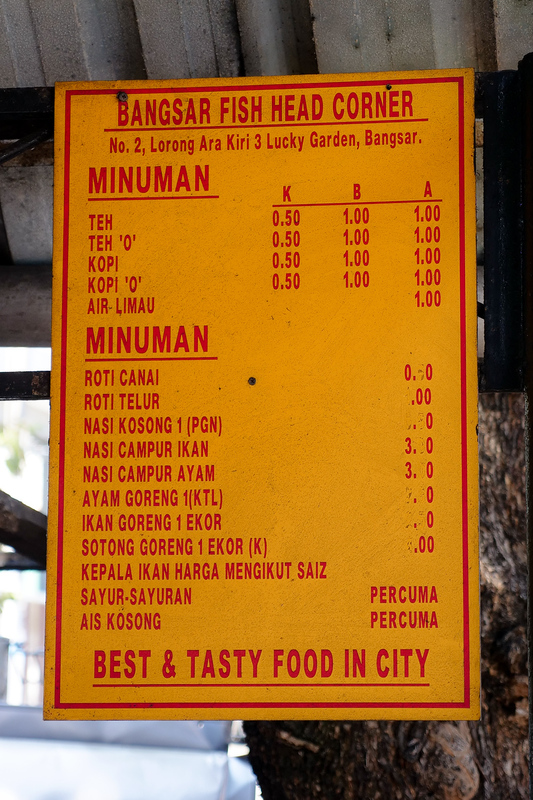 Prices: Mr. Annuar gave us the meal complimentary only because he is so generous, not because we asked (but just so you know, the prices here are great!, and people know his restaurant locally as one of the most-for-your-money-meals in all of KL). 52 comments. I'd love to hear from you! The sweet and savory aroma of the curry simply smells the best when it’s served fresh. Hats off for your hard work. Fish Head Curry Street Food Corner Lovely work. Thanks very much John, happy to do the work! This is a wonderful restaurant indeed. Take care, all the best! Wow! Great article and I just for the first time made Fish Head Soup for my Malaysian friend! We’re in New Zealand on a Workaway. It was awesome so reading your article and seeing your fantastic photos was really a treat! Donna, incredible! Thank you so much, very cool to get a message from New Zealand (very high on my “Places To Go” list). Thank you for reading, it is our pleasure to record these experiences for you to enjoy, thanks again, and take care! Wow! thanks for nice posting, I like fish curry. Hi Narendra, thank you for responding! Have a great day. I love chicken and fish curry. This makes my mouth watering and I can have them at anytime. Though, I like roasted chicken as well but there is nothing special than fish curry. Hello Vuzuk! Thanks for the great comments, and good luck with your website and blogging future! Have a great day. This is such a mouthwatering article. What I know is only chicken curry, never thought that there is fish curry and it really looks delicious. Katherine, thanks very much for writing! Yes, the fish curry here was just as good as the chicken, it was all amazing because of his genius curry sauce/broth… I would love to go back immediately. You’re very welcome Deva, have a wonderful day today! Recently i watched this video in your youtube channel. I hope you had a wonderful dish. My mouth was melting by seeing this foods. I like fish food. The source of Protein is fish. Hello, and thanks for writing! Yes, I agree with you in that KL would be a wonderful place for a honeymoon, maybe I should take your advice on that myself 🙂 Have a great day, see you on the next article! The sweet and savory aroma of the curry simply smells the best when it’s served fresh. Coupled with a huge fish head where it’s both fleshy and flaky, it’ll be a treat to say the least. Delicious gravy, perfectly balanced with spiciness and creaminess, a fish head curry is a family’s best friend to pair with some fragrant rice. Mouth-watering dishes, which one you liked the most? Hi Sathya, thanks for your question. Well, as the fish head was so unique (and huge), I have to pick that fish head. But really, the secret was in the curry sauce – anything it touches just turns to delicious gold! Any idea if they do a vegetarian version? Hi, thanks for writing (even on an article obviously dedicated to more meat-heavy menu selections, really, thank you!). At this restaurant in particular, I doubt there are any vegetarian options from the menu. But, the restaurant next door to the Fish Head Corner is actually owned by a friend of Mr.Annuar, and they had an amazing selection of Malaysian food, I counted over 25 trays of amazing looking food, the grandmotherly chef makes them all herself, and they smelled absolutely incredible as well (and there were many vegetarian options). Have a great day! I love your YouTube videos and now following your blog. 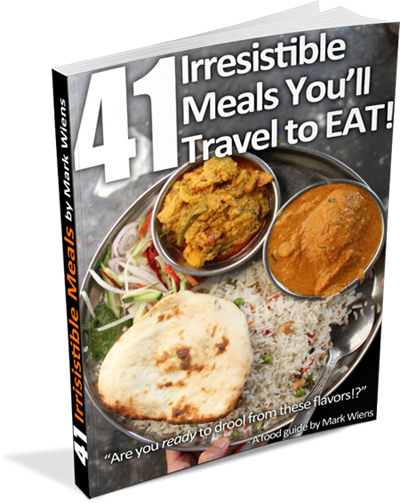 Food tours you make are really amazing. Learning a lot about other food and culture through your lens. Very happy to be of service, thank you for your comments and support! Have a great day today! Great work. Well done. Hats off for your hard work. Fish Head Curry Street Food Corner Lovely work. Abhi, thank you so much for writing in! Have a great day today! Great fish food delicious and your delicious Awesome post, and relay appreciate your good job, Thanx a lot and Cheers . Thanks for the great support Adam, we had fun eating of course, but its so great to read all these positive comments. Have a great day today! That fish head looks absolutely delicious! And Mr. Annuar seems to be a wonderful host. Glad to read again one of your delicious posts 🙂 Cheers! Hi Janice, thanks for your wonderful support 🙂 Yes, it is a special day when you can perform such meat-finding explorations using such a monster and gorgeous fish head! Have a great day! Hey there, Joel! Thank you too 🙂 Indeed here’s a toast to fish heads, curry and the all goodness that food and travel brings..it gathers us all over the world. More power! and good vibes,man!! Deep Das, thanks for the comment, yes – this fish is absolutely awesome! Hasan! Thank you for the comment, and for your delicious-sounding recommendation! Regarding the recipe, I don’t know for sure, but I would imagine this is one recipe that the owner’s won’t be quick to share… but it was very cheap! And finally, about the restaurant on Jalan Angsana, we will be back! Have a great day! Hey Joel, hope you had a great time there and of course a great meal. This fish head tempts me to eat now itself. I just want to go there just to eat the gigantic fish head meal. I think, here everyone will think like that only after seeing you post. Because this post has so much power to make them hungry. Tara 🙂 Very happy to read this, thank you so much for your comment, your support, the motivation we get from these messages is very real – so thank you for taking the time to write. Have a wonderful day, see you on the next article (Hint, I think it includes durian 🙂 ). This food looks amazing. The pictures are making my mouth water! Thank you for sharing! Thanks a lot Yana, it was a really good day, I hope you have the chance to visit some of these restaurants in the future someday as well! Thanks Alistair, have a great day! Hi Ayush, thanks! It was a great day. Mark, thank you for this recommendation. I moved to KL with my family a few months ago, will try this amazing looking place in the next week or two. So true, Malaysian food is unique and addictive, not too mention how kind and friendly Malaysians are. Thanks again! You must have a cast iron stomach! I LOVE curry but I can’t get past the look of that big fish head. It just looks awful lol………………. I am sure it tastes great but this one is not for me!